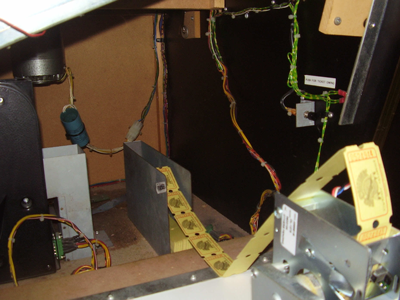 TRR-FEC #32 - Technical & Operational Tips - Alpha-Omega Amusements and Sales, Inc.
Service and modification tips are great time and parts savers and also help increase game revenues. If any of our reader technicians have a tip, please email it to Frank the Crank at fseninsky@aol.com. Be sure to include your name, title, and facility. All tips are much appreciated. Our company, Alpha-Omega Amusements, continues to operate token pusher games because this category still generates a huge percentage of our total revenues. Many facilities have opted to go ticketless and pushers do not earn well without tickets. For those who work with high volume pushers, the higher the ticket capacity, the less times during the week we techs have to load tickets. Take a look at pictures (before and after) and see the difference that 2 extra stacks of ticket capacity can make! The original one stack ticket bin looks so anemic. My experiment with the super-sized tilted ticket bins is progressing since the initial success with our Atlantis pusher that I wrote about in the July-Aug Redemption Report. On the second 3-stack ticket bin I installed in the Gold Coast pusher, I trimmed off 1” and was able to ‘tilt’ it into the Gold Coast cabinet fairly easily. On the first attempt I found it necessary to cut a 2” wide notch on an interior wooden cross member of the cabinet (composite wood 3/4”x 4”) to allow the un-trimmed 3-stack tilted bin to pass through. The notch is not necessary if the angle of the support bracket is reduced by 20 degrees. I am going to use one of the six 3-stack bins that came with my Monster Drop (this bin is not necessary so our company can save $20) to finish off the Gold Coast 3 & 4 player positions and see if I can do it without cutting any notches in the cabinet or trimming the 3-stack ticket bins. Persistence pays off. The Gold Coast upgrade modification just became infinitely easier. Forget about notching and trimming to make the 3 stack ticket bin fit. Just straighten out the upside J- hook on the 3-stack bin, bend it to a 45 degree angle, drill a hole thru it and screw it to that wooden cross member. The 3-stack bin will hang tilted just like in the picture but without the need for a support bracket. The bottom corner of the bin simply rests on the floor of the cabinet. It’s a 5-minute job tops! The results of my adventures prove that you can convert Atlantis and Elvis pushers to 2-stack ticket bins in each bay and Gold Coast can handle 3-bin stacks. Each bin change would cost about $20. Benchmark sells 3-bin stacks for $19.95 (part# THSHM002). This is the same bin that the Benchmark Monster Drop (all models) uses. 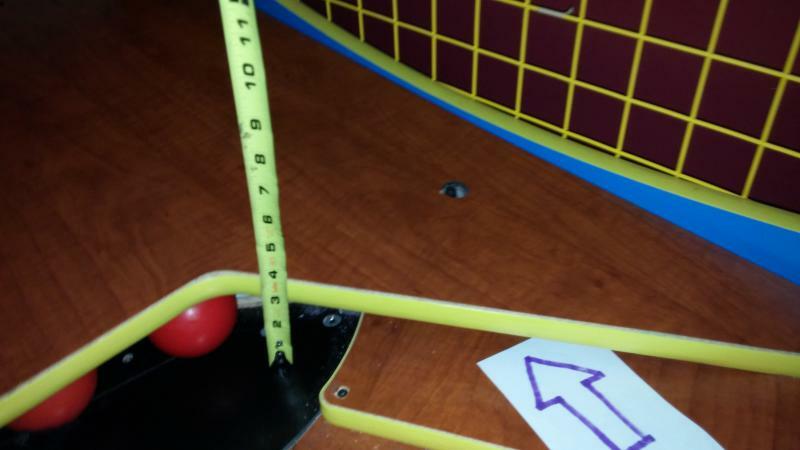 Frequently I would pass by my two Down the Clown games and notice guests tossing balls when there is zero time remaining on the clock. The Gate was stuck open…Again! The 2 piece Butterfly Gate would wedge a ball while opening at the start of a game or while attempting to close at the end of a game. The clowns reset automatically if a game is in play or not. This helps present a “ready to go/play” draw. When the Gate does not close the balls are now FREE to be thrown indefinitely. No tickets are won but the game is still a lot of fun for guests. 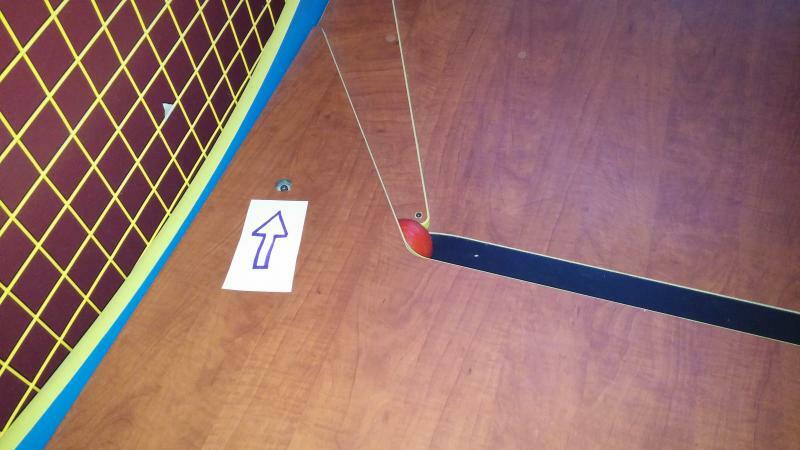 The first picture shows a wedged ball in the “tunnel”–this can happen on either side. Simple Fix. Loosen the Allen Bolt (arrow is pointing to the gap between the two boards) on both sides and simply place a wedge, washer or spacer between the two boards and re-tighten. Leave enough space for balls to not “rub” the top of tunnel at the sides. The game comes with an upper board clearance spacing of 3 inches. I increased the space to 3-1/2 inches and the balls never jam or prevent the Gate from closing. 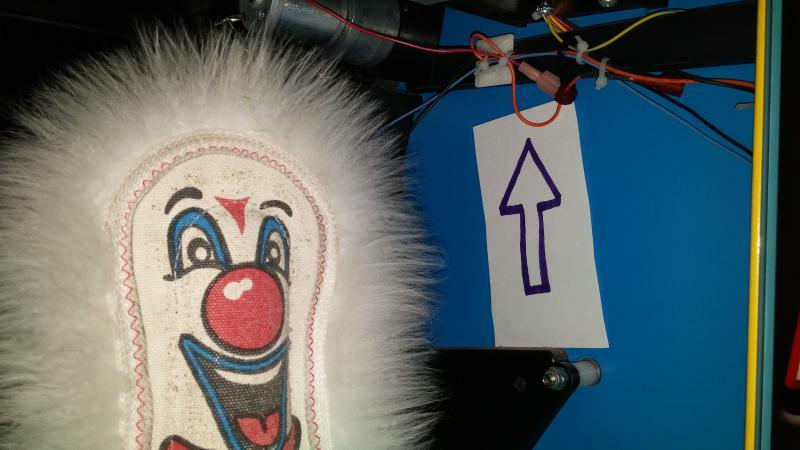 Another Down the Clown problem to easily solve is blocking “exposed wiring / motor” that are in direct fire from balls being thrown at our clown targets. 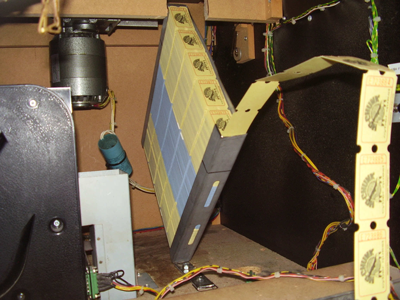 You can see that previously I had to reattach/splice some wiring. Where the arrow is pointing you can attach a “blocker” with a 3 inch sheet rock screw. What worked best for me using was a spare Clown Ball with a screw through it blocking errant shots. Ideally you can use a block of colorful wood. 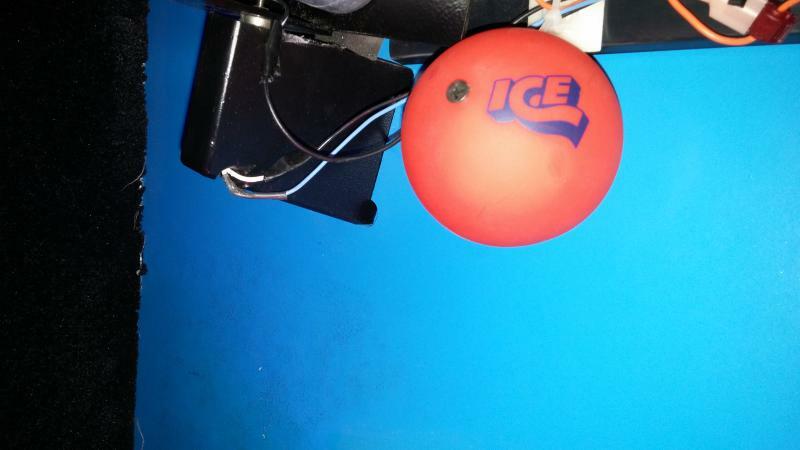 One drawback to using a Clown Ball is customers sometimes think a ball is stuck up there and they ask me to remove it.